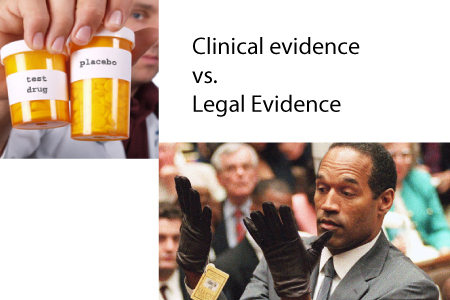 The “gold standard” in medical science is a shotgun admission of ignorance known as the Double Blind, placebo controlled, randomized clinical trial (RCT). In my recent problems with the FTC, the order they want me to sign is to not discuss anything related to telomerase activators unless and until there is a randomized control trial; when such a study was published, their experts decided to disbelieve it and keep the legal adventure alive. The premise of the randomized controlled trial is a good one: it says because of bias and confounding (correlation which is coincidental, not causally related) given a large enough sample size and good randomization, then a difference in the exposed and placebo groups would be statistically significant although not necessarily causally-related. The problem of a randomized controlled trial is that it doesn’t explain mechanism or pertain to individual subjects. For example, it is said that up to 44% of pharmaceuticals act dangerously differently dependent upon genes of the user. But if a certain number of people can’t take advantage of the benefits or have adverse reactions, the blanket condemnation appears on the ridiculously fast and insane sounding disclosure such as “may cause seizures, blindness or death. Call you doctor or go to the hospital if one of these occurs”. There is a distinct role for experimental microbiology, case control studies, cohort studies, and case reports. It is not just about RCT. The beauty of double blinding is that the subject and the observers don’t know if the exposure has occurred. In practical terms, this is not possible for some exposures, such as being slapped in the face. Another beauty of placebo controlling is that half of the subjects aren’t getting anything active. The problem is that given the innate ability of the person to create reality in the body, belief makes the placebo effect very real, so hopefully they don’t know what exposure is being measured. When we used to do journal club in medical school and during my public health training, it became clear that any journal article could be impugned with sophistry. There are many flavors of bias, questioning motives and integrity, casting aspersions on study design and statistical methodology, and general attacks on relevance and repeatability. Think of it if law were practiced in the same manner. Every crime is an “n = one” or single case study. If we did a randomized controlled trial of domestic violence, then we might conclude that being male was associated with committing this crime versus being female. When a case came to court of domestic violence, we would only arrest the men because the RCT showed that all other things being equal, being male was correlated with committing the crime. Case closed. If you really want to feel disillusioned, read what Dr. Marcia Angell, former editor of the New England Journal of Medicine turned truther says about it being “not possible to believe much of the clinical research published.” Apparently the ecology of money infused with research, drug development and approval, consultancy, and academia produces some bad science. The following in no way represents anything other than a single anecdote, and impossible to generalize. 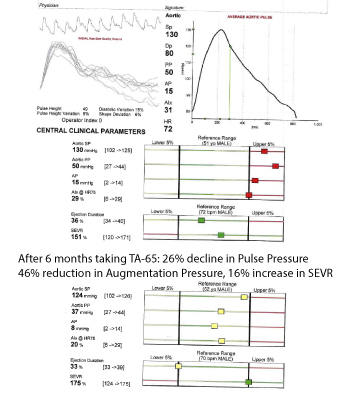 In no way can I say that the two things are related but in this 51yo man that I spoke to today, 6 months of TA-65 ingestion at 4 capsules nightly was associated with radical improvements in his cardiovascular efficiency. I can find many explanations but the fact is that I see too many cases of improvement for me to think this is placebo effect. There are multiple confounding factors like improved sleep, exercise, mood- that much is true. If you consider such anecdotes interesting, please consider donating to my Legal Defense Fund. If you do not, there is a real possibility that these kinds of reports will be made illegal by my coerced consent decree.